Try our free Printable Secretarial forms such as Secretary Job Description, Microsoft Word Keyboard Shortcuts, Phone Call Log Forms, Business Letter Templates, Memo Templates and more. Forms can be very helpful for the secretaries in a small business. Secretarial duties are so diverse and numerous that it takes a special person to fulfill these job duties. Finding free business forms is a huge plus to secretaries mainly due to the fact that they have to generate these forms. The Secretary/Receptionist job description can be utilized when you hire a secretary/receptionist. This job description will give tasks, responsibilities and skills of the secretarial role. These job descriptions will also create an opportunity for your director to clearly identify and spell out the responsibilities of your job. The Business Letter Templates (Full Block and Formal Styles) samples below are ready to download and use for your next letter to be mailed or issued. The full block business letter template is aligned flush to the left side of the letter and the formal business letter is not aligned flush to the left side. The Memo Templates can be used when you need to communicate throughout the entire company with one brief note that can be easily emailed or distributed to each employee, etc. Keep the original memo template in an easily found folder on your hard drive to pull up a blank memo when needed and then “save as” a different file (example: memo7212012) to type your current memo in. It’s great practice to save your memos for a little length of time on your hard drive for the unexpected moment when you might have to send it out once again. The Microsoft Office Word Keyboard Shortcuts will be an asset for your secretary if she has Microsoft Office Word, which is widely used in the most businesses today. Most secretaries are searching for every and any way to save time in her/his busy schedule. For example: “Ctrl c” will copy highlighted text an”Ctrl v” will paste it in the designated area. 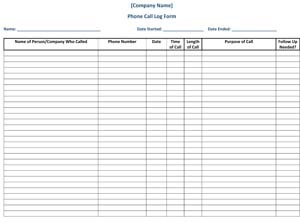 The Phone Call Log Form is used by most secretaries to log all company calls with name of person or company that called, number, date, time of call, length of call, purpose of call and if follow up was needed. On each form the secretary will insert his or her name and the date they started and ended the form. This form will be used for many purposes such as the company seeing how many calls come in and at what times, etc. The Phone Message Log is used by most secretaries to log all missed and placed calls. You can also organize and prioritize which calls to respond to first. Without phone message organization on a log or notes you will eventually become so unorganized that your office cannot function. Always make it a practice to log calls if possible.